Can states issue tax credits through taxpayers’ charitable contributions to offset new state and local tax (SALT) limitations under tax reform? Several states have been creative in finding ways to work around the new limitation. Specifically, the question is whether the individual taxpayer can make a charitable contribution, which is fully deductible on their individual income tax return, in exchange for a credit generally on their real estate tax bill. Several states intended this as a means to work around the state and local tax limitation that was part of tax reform enacted in December 2017. In May, the IRS indicated that regulations would be forthcoming on the issue and to proceed with caution in establishing and/or contributing to these charitable funds. Now the IRS has issued its long-awaited proposed regulations addressing the issue of whether taxpayers can make charitable deductions in exchange for a tax credit. As you may recall, the Tax Cuts and Jobs Act (TCJA) limited the itemized deduction for state and local taxes to $10,000. This did not sit well with high property tax states like New York, New Jersey, Connecticut and California. Some states (New York, New Jersey and Connecticut) quickly enacted legislation permitting local governments to establish charitable funds to accept donations that the taxpayer would then receive as a real estate tax credit equal to all or some of the donation made. The thinking was that if a taxpayer made a $1,000 donation and received an 85 percent credit on their real estate bill, the taxpayer would receive a $1,000 charitable contribution deduction on their federal tax return. According to the new IRS regulations, which went into effect Aug. 27, 2018, if an individual receives a credit of 15 percent or less of the charitable contribution, a full deduction is permitted for the charitable contribution on their federal tax return. If the credit received is greater than 15 percent, the amount of the charitable deduction is reduced by the amount of the credit received. For example if an individual does a charitable contribution to one of these funds in the amount of $1000 and receives a 70 percent credit on their real estate taxes, the amount of the charitable deduction permitted federally would be $300. The deduction would be calculated in the following manner: $1,000 donation minus 70 percent credit, $700 equals an allowable federal charitable deduction of $300. If the taxpayer makes a $1,000 charitable contribution and receives a 15 percent credit, the entire $1000 would be permitted as a charitable deduction under the IRS regulations. The new regulations are purely focused on state tax credits and not on state tax deductions that are granted for certain charitable contributions. Any charitable contributions that generate a state tax deduction are not impacted by the regulations. 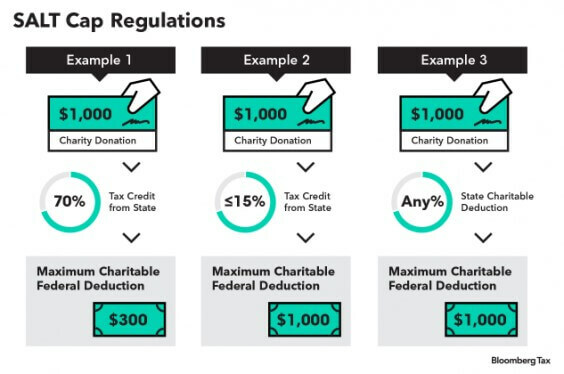 If a taxpayer makes a $1,000 charitable contribution and receives a $1,000 state charitable deduction, the taxpayer is still entitled to a $1,000 federal charitable deduction. The basis of the regulation is the old “quid pro quo” legal doctrine, which is when a taxpayer makes a charitable contribution and receives a valuable benefit in return, the taxpayer can only deduct the difference between the contribution and the benefit received. The regulations apply to pre-existing and new programs enacted since federal tax reform in 2017. School voucher programs are not impacted by these regulations. New York, New Jersey, Connecticut and Maryland filed suit in July against the Trump administration, indicating the new state and local tax cap unfairly targets certain states. It is expected that this suit will continue.